I am so excited! 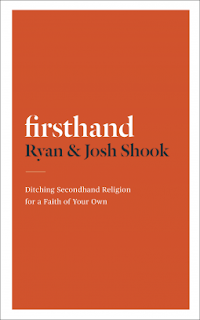 I have been asked to read and review the book firsthand by Ryan and Josh Shook and then shoot a promo video of my review! My book just arrived today! Be sure to Follow Me and I will let you know when the video will air. Just click the Follow Me link and sign up. After the video airs I will be hosting a Book Give Away Contest to give away a couple of copies of the book firsthand. Check back or Follow Me to be informed of when the contest begins.